ROV Head-Up Display discussing - Zharkov Lab. ROV pilot’s overlay – ROV Head-Up Display. What kind overlay it should be? What do we expect from ROV HUD? First of all I think we expect the convenience during the ROV mission that it may give us. The convenience of understanding the vehicle’s state, it’s absolute and relative position in the space down there. Data availability, its fullness, the quickness of analyzing and perception of the information are perhaps the main requirements to that kind overlay. I would like to invite all interested in the subject to discuss it. I think any thought or experience that some of you can have might be interested talk about. I’m finding this subject interesting just because I created my overlay on my own having neither experience nor even thoughts what it may look like in the beginning. Opportunely to say my experience as ROV pilot was starting then. The company that I worked for that time had just bought the Seaeye Falcon system. Many of you know that this vehicle has its own overlay implemented into system. It visualizes values in the form of alphanumeric data. To me who hadn’t worked with such equipment it look not enough as I needed to analyze these values and to compare them with navigation screen to have full picture of what is happening with my vehicle. Graphical information would look more profitable. That became the starting point in creating my ROV HUD application. Many things that I was thinking about that time are realized differently. Many of them are left behind at all. For my opinion the pilot’s overlay that I finally came to is more or less the one that brings the idea to pilot on the situation and the vehicle’s state. I think it gives the needed functional that may help in routine ROV missions. That is what I think. However I’m very interested in opinions of experienced ROV pilots. It may be good to discuss it. Talking to one pilot once I asked him what overlay data he would suffer for. He answered ‘… when I’m operating the sub I really need to know where to go’. We all know that the most ROV operations are provided with navigation support. The navigation screen is always somewhere near. I already had targeting overlay had done by that time. That fellow just proved the right direction of my thoughts. Beside the targeting overlay I implemented vehicle’s orientation graphic information which is expected and doesn’t bring any new idea by itself. There are other monitors with information that is interested during the operation. 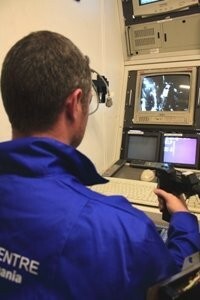 It would definitely better to have it overlaid onto the ROV video to be able to concentrate on less number of monitors. I took into the consideration the fact that one of the main goals during performing ROV missions is to record the video. Therefore my overlay shouldn’t be looking as pile of infused components that obstructs the video. Of course I saw other ROV HUD overlay realizations on the Internet. Every developer created the thing basing on his own view on how it must look, what sort of information it should give. This has made me interested in opening the discussion to exchange opinions, to hear people. It would be good to know what ROV pilots expect from that kind overlay, what they would wish to see or to have and what they wouldn’t. All and any thoughts and opinions are very welcome. I do appreciate your participation in the discussion in advance. Very happy to see that someone has taken the initiative to develop a higher technology in regards to ROV piloting than what is currently available. Recently I have taken to piloting aircraft as well. While I have not piloted using a heads up display I must say that in the cockpit of an aircraft there is much information to process and typically this information must be processed in a very short period of time. This being due to the fact that the faster your environment is moving the less time you have as a pilo to react to a given situation. While this does not necessarily apply to ROV as the average system is limited to operations in water below 3 knot current we can still take the advantages of a heads-up-display and articulate those advantages into a modern ROV system. As an ROV pilot the features I would most eagerly enjoy would relate to situational awareness i.e. (what is the ROV doing...pitch, roll, depth, and altitude) but now having read your HUD description more throughly I cam see that also it would be beneficial to incorporate navigational components into view. Right now I am on a job laying a pipeline at approximately 3000fsw. ROV systems is a Schilling Robotics 250 horse power UHD and back up system is a Sub-Atlantic Mohican. Now, in acquiring the target sub-sea we use a variety of sensor or acoustic beacons which allow the survey technicians to display the relative position of all assets (vessel, pipeline, ROV, etc). The downside is that one must monitor several different screens to acquire the needed information to pilot towards the target. Now, if you could come up with a way to compile the information being generated by survey in regards to positioning so that if the ROV pilot was wearing the headset and could see exactly which course needed to be flown to acquire the target and additionally could devise distance to target so that it would be unnecessary to look away from the main piloting monitor this would be something quite amazing I think. When it comes to cool technology I always like to look towards Hollywood. The ideas that are portrayed in the movies is always what we seem to be working towards. I had also thought how cool it would be to be able to project a path into a HUD display so when there is zero visibility the system still provides you with an overlain path of travel which can be followed. Of course this would all be for the pilots benefit and client video can be recorded without the HUD overlay. Imagine then if you provided this same technology to a car manufacturer so a driver can drive through a snow storm with poor visibility but still see the road. That may be looking a little too far forward but really how difficult is it to leap from what you are talking about to this forward looking realization. I very agree with the statement you’ve made concerning time that needed to assess the situation and work out the decision. And HUD information collected in the same place is very helpful in such a way. It will also affect on the ROV service quality and of course safety. ‘When it comes to cool technology I always like to look towards Hollywood. I absolutely agree. I assume that Steve Jobs watched Stanley Kubrick’s 2001: A Space Odyssey. We have iPad now! Of course this is an assumption. But it looks to me very likely. Yes, I was thinking about that already. I was even thinking to provide a pilot with a sort of backtrack and other things like that. To do that the database’s facility would need to be implemented in the app. This is something that I need to solve in the future. I enjoy reading through a post that will make people think. Also, thank you for permitting me to comment! You can definitely see your expertise in the work you write. The arena hopes for more passionate writers like you who are not afraid to mention how they believe. Always go after your heart. As the admin of this site is working, no hesitation very quickly it will be renowned, due to its quality contents. Way cool! Some extremely valid points! I appreciate you writing this write-up plus the rest of the website is also very good. First off I want to say great blog! I had a quick question which I'd like to ask if you don't mind. I was interested to find out how you center yourself and clear your head prior to writing. I've had a difficult time clearing my mind in getting my ideas out. I do enjoy writing but it just seems like the first 10 to 15 minutes are generally lost simply just trying to figure out how to begin. Any suggestions or tips? Cheers! Its not my first time to visit this web site, i am browsing this site dailly and get fastidious information from here daily. Hi, Neat post. There is an issue together with your web site in internet explorer, would check this? IE still is the marketplace chief and a large part of other folks will leave out your excellent writing because of this problem. Have you ever considered creating an e-book or guest authoring on other websites? I have a blog based upon on the same topics you discuss and would really like to have you share some stories/information. I know my viewers would value your work. If you're even remotely interested, feel free to shoot me an e mail.